Izzie Lewis is a milliner with a reputation for finely designed and crafted hats. Susan Phinney, of the Seattle Times, characterizes her work as "so beautifully made it could be worn inside out." 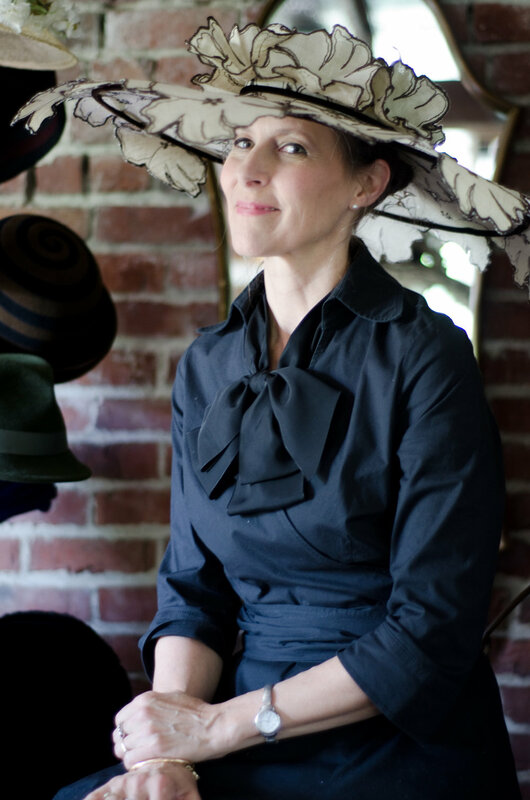 Izzie's hats are included in the permanent collections of the Fine Art Museums of San Francisco, deYoung Museum and the Museum of History and Industry, Seattle. Her work has been featured at the Bellevue Art Museum, Bellevue and in stores such as Nordstrom and Barneys New York. Formally trained as an architect, Izzie began the transition to milliner in 1988. She has studied with numerous milliners over the years. Mingling architectural influences with a deep love for textiles, Izzie's hats can be distinguished by precise construction, attention to detail, unique use of materials, and a sense of innovation, geometry, and purity. With inspiration around every corner, Izzie's studio is a rich environment filled with the many tools and materials of the trade. Please visit by appointment thru our CONTACT page. Each hat is created by hand using traditional (and sometimes innovative) millinery techniques. Izzie uses the finest fur felts, imported straws, and fabrics along with vintage materials from her large collection of ribbons, flowers, feathers, and other specialty items. After stretching the raw materials over wooden blocks, the hats are then finished and trimmed with loving care.